Rollin' down the river with Proud Mary and her krazy krewe! : Oh how I love pack and plays! Since Noah is walking and pretty much getting into anything and everything lately, I really cheerish our pack and play. It's one baby item I can say I used from day one till now (thanks to "Pops" for buying it for us). 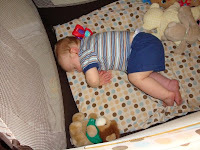 As an infant (say under 3 months) it was great to put him in the bassinet part as he naps. Now it's been great to keep him entrapped! I put him in there every morning while I'm getting ready and not really in the afternoons/night since we play. I know I said this about the jumperoo, but how will I live without this? It will only be a matter of time that he can climb out and I dread that day for many reasons. Ofcourse the obvious that he can't be in one safe spot but the fact that he won't be a baby anymore. However, I could use the extra room in the den to put more of Noah's oodles of toys.